History of Washington Park - Washington Park Association, Inc.
Buffalo Bill's Wild West Show in 1908. 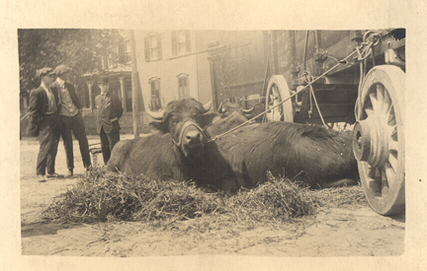 Buffalo on North Street. Post Bill for the Wild West Show "An Attack on the Overland Stage"
The story of the creation of Washington Park brings to light two interesting families who were instrumental in its development—the Suckley and Allen families. The Suckley Family (pronounced Sook-lee) had the misfortune of having a surname that could be mispronounced to their detriment, but they had the good fortune of having great wealth. While not as prominent as other New York families, the Suckleys were among the richest of New Yorkers. George Suckley arrived in America from England in 1806. An industrialist and importer, he found much success in New York and steadily grew the family’s fortune. Suckley married Catherine Rutsen, a descendant of the Livingston family of upstate New York, and thereafter, they lived in palatial mansions among the aristocracy of the Hudson Valley. The family wealth was centered in real estate, and they owned large portions of Manhattan, Brooklyn, and New Jersey, including the acreage that was to become Washington Park. At the time of the death of George’s son, Thomas Holy Suckley, he was said to be one of the largest land owners in New York State. The plot’s principal purpose came to be as a carnival ground where visiting carnivals, circuses, and Wild West shows were staged. These events were held at the site on such a regular and frequent basis that the plot was more often referred to as the “carnival/fair grounds.” (Years ago I did some research for the descendant of a women who was one of the most famousequestrians in Wild Bill Cody’s Wild West Show. After performing at the site she became enthralled with the area and settled into a home on Central Avenue. She lived there for a number of years before she relocated to Nutley, NY, to be closer to her good friend and fellow performer Annie Oakley.) With all these shows taking place before the advent of our modern forms of entertainment, the Suckley Estate became an integral part of Hudson City life. entity, would attract attention as the potential site for a public park. It is at this point that the Allen family enters the picture. The Allen family arrived, in what was then Hudson City, in 1867, when the head of the family, Rev. Henry Allen, assumed the position of pastor at the United Presbyterian Church, located at Seventh Street and Bloomfield Avenue in Hoboken. (The church is still there, but I have not been able to determine if the current building is the original one.) Rev. Allen had been born in Tyrone, Ireland, and was considered to be a brilliant Greek, Latin, and Hebrew scholar. He gave each of his children names with six letters, each taken from one of the three languages (hence the name “Ulamor”). Upon arriving in America, Rev. Allen attended Miami University (in Ohio) and Oxford Theological Seminary and paid his way by his silversmith trade. Once he graduated, he took up the ministry in various areas of the Midwest until being summoned to Hudson County. His wife was Elizabeth Anne Richardson, born in Butler, PA, and a descendant of a family which, at one time, owned all of the heart of Philadelphia. Unfortunately, Rev. Allen’s service in Hudson County was cut short when he suffered a sudden and fatal heart attack on Christmas Day in 1867. Thereafter, the eldest son, Alvoni Allen, assumed the responsibility as the head of the house. After a number of jobs in New York City he became an independent carpet importer. He was offered a job with W&J Sloane, the largest wholesaler/importer and retail carpet manufacturer in New York City, as head of their credit office. Considered to be the “best credit man” in the city, Alvoni eventually rose to the position of partnership within the firm. After retiring at an early age he devoted his life to civil responsibility and was a leader in art, literary, and historical organizations, serving as president of the Jersey City Public Library. His second wife, Nellie Wright Allen, was one of the founders of the Jersey City Museum. Alvoni’s brother Ulamor was his junior by four years and had been born in Warren County, Ohio, on August 13, 1854. After the death of their father at the family home at 401 Ogden Avenue, he was educated in Jersey City public schools and studied medicine at New York University and Bellevue Hospital Medical College, from which he graduated in 1885. He served on the staff of the old Jersey City Hospital and was a consulting physician at Christ Hospital for more than twenty years. In 1895 he founded the Central Building and Loan Association in Jersey City Heights. Deeply active in civil matters he was appointed to the Jersey City Board of Education in 1901. This was the only public office he ever held. He was active in the movement for the creation of Riverview Park and in 1909 was one of the founders of and became president of the Suckley Park Association, whose mission it was to establish a county park on the current site of Washington Park. Dr. Allen died suddenly at his longtime home on Odgen Avenue on April 21, 1922. He was survived by his wife, Clara O. Martin Allen; a son, Ulamor Kenneth Allen; and a daughter, Dorothy Cornelia Allen, wife of J. Waldo Booth. Buffalo Bill's Wild West Show in 1908 at "North Street Grounds" a.k.a. Washington Park. On January 12, 1909 a joint committee representing various Hudson County groups met at the Twelfth Ward Democratic Club, 471 Central Avenue. For a year this committee had been informally discussing the vast Suckley Estate straddling the Jersey City-west Hoboken border, as a county park site. The main barrier to the proposed park was the delay of the Hudson County freeholders in the furnishing the Park Commission the necessary capital. Consequently the park commission could not purchase the Suckley Estate and other smaller properties that made up the site. At this meeting the joint committee established a formal organization to petition the agencies involved to secure this 22-acre tract. Some of the groups represented were Hudson City Business Men’s Association; Twelfth Ward Improvement Association; Western Slope Improvement Association; Hudson County Democratic Association and the Town Improvement Association of West Hoboken. Meetings were scheduled for the second and fourth Tuesday of each month and the members agreed upon ten cents as the monthly dues. The members also decided to encourage anyone interested in the project to join. The Hudson County residents believed that a united effort on their part, displaying their sincerity and resolve, would influence the Freeholder and expedite the necessary financing. It was in this belief that the Suckley Park Association was born and Dr. Ulamor Allen was chosen as its president. Dr. Allen and Members of the Suckley Park Association appeared before the Hudson County Park Commission on June 8, 1909. Not only did speak for their cause, but they joined with others who were asking the Park Commission to purchase the Currie’s Woods site for a county park. The Currie’s Woods Park would straddle the Bayonne-Jersey City border. The show of unity and support for each other’s cause inspired the June 9, 1909 edition of the Evening Journal’s (now The Jersey Journal) editorial to comment”… the fact that each side also advocated the cause of the other made these two hearings quite different from others at which the sole argument has been that this or that section of the county ‘demanded’ a park site because it wanted a park entirely within the boundaries of the sector represented. The editorial continued: “The Currie’s Woods and Suckley Park sites are unique in that they are what have been termed ‘border line perks. The sectional line has not been drawn in either case. It is the case of the greatest number and if the future development of the county park system were judged from no other standpoint, it would have to be conceded that at the present time there are only two park sites deserving of the attention of the County Park Commission and these are Currie’s Woods and Suckley Estate. But of course it was not clear; it was paved with bureaucratic red tape and it was exceedingly long. On July 14, 1914, the Suckley Park Association, led by Dr. Allen, appeared before the Park Commission and asked them to requisition The Hudson County Board of Freeholders “now” for $500,000 for the Suckley Estate. The matter was laid over till the next meeting. At the following Park Commission meeting on July 21, Dr. Allen and members of the Suckley Park Association were present. The commissioners asked the county counsel for an opinion regarding their power to condemn the land involved before the Board of Freeholders issued the necessary bonds to purchase the land. At their July 28 meeting the counsel told the commissioners that they had no such power. The commissioners did pass a resolution asking the Board of Freeholders to borrow $500,000 by issuing bonds. However at the October 5, 1915 meeting of the Park Commission, Dr. Allen was told that their request for $500,000.00 to the Freeholders on July 14, 1914 was “null and void” because various legal technicalities. The county counsel advised that if they still needed the money they should make another requisition. Dr. Allen again asked the Commission to requisition the Board of Freeholders for the money and they did. At this point, the Hudson County Park Commission began working actively in order to make Washington Park a reality. Letters were written to the town of West Hoboken regarding its involvement. Boundaries were established, and people owning property within the sites were contacted. New Jersey Title Guarantee & Trust Company was hired to search these properties. On October 10, 1916 Br. Allen was invited to the Park Commission meeting to discuss the legal problem concerning a portion of the proposed park site. The commissioners felt that the portion in question should be eliminated. Dr. Allen disagreed. He stated that the association was not in favor of eliminating any portion of the site. After some discussion, the commission agreed with him. Dr Ulamor Allen was present at the December 4, 1917 meeting of the Park Commission. At this meeting the county counsel reported that a final agreement had been reached regarding the cash awards to the property owners involved in the proposed park site. Ten separate awards, totaling $562,435 were made. Washington Park has an encouraging, historical identity. Its history shows the effectiveness of community action culminating in positive results. Clearly, the park did not grow overnight; its concept was cultivated and nurtured by a group of enthusiastic and persistent Hudson County residents inspired by their leader, Dr. Ulamor Allen. Shamburg, J. J., 1980 Dec 11. Dr. Ulamor Allen and the Fight for Washington Park, The Jersey Journal.